Most things come in sizes: small, medium, large... big, bigger, biggest... small, huge and the like. Simple names to describe simple things. Sometimes, though you'd encounter names that would need more brain power in determining just what is being presented to you. As for shirts, the common small, medium, large with xtra small and xtra large (and sometimes 2x and 3x large) fit both ends of the spectrum. At least everything is relative to each other. Most fastfoods offer drinks but they always start with medium, then large. If there's a medium and large, how come there's no small ? Wendy's has a Biggie sized drink, which is like extra large. What about Starbucks cup sizes ? I still get confused with the names they use: tall, venti and grande. I later found out that grande is Italian for "big" and venti is Italian for "twenty" which is the no. of ounces the grande size holds. So tall is small, grande is medium and venti is big? Confusing huh ? With cinemas, there used to be three sections: orchestra, lodge and balcony. Now it's just orchestra and deluxe. But some people out of habit would call the upper portion balcony. Some cinemas call their seating sections deluxe and premiere. So is premiere the balcony and deluxe is reduced to orchestra ? Speaking of "deluxe", how about hotel rooms ? Deluxe sounds like an above-average room for me, but for some hotels, deluxe is the chepeast and smallest room. Even a Junior sized room is bigger. And when you hear of a Junior suite, how come there isn't a Senior Suite which could pertain to a bigger room ? Instead it's an executive suite. And what's bigger, an executive suite or a presidential suite ? What's the difference ? Most of the time, I look at the prices cause numbers are easier to weigh on which is which than these names. It's with these kind of names I cherish the computer acronym when coding programs, KISS : Keep It Simple Stupid ! True, very true. Haha. It's all very confusing, especially with the hotels! I wish everything was uniform. "I later found out that venti is Italian for "big" and grande means twenty which is the no. of ounces the grande size holds. So tall is small, venti is medium and grande is big. Confusing huh ?" You are really confused! Because venti is from the Itaian word "venti" meaning "twenty." 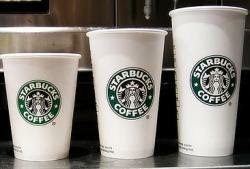 A Starbuck's twenty ounce coffee drink is known as a venti. Not Grande.